Appliances are the most likely cause of water damage to a home after external flooding. 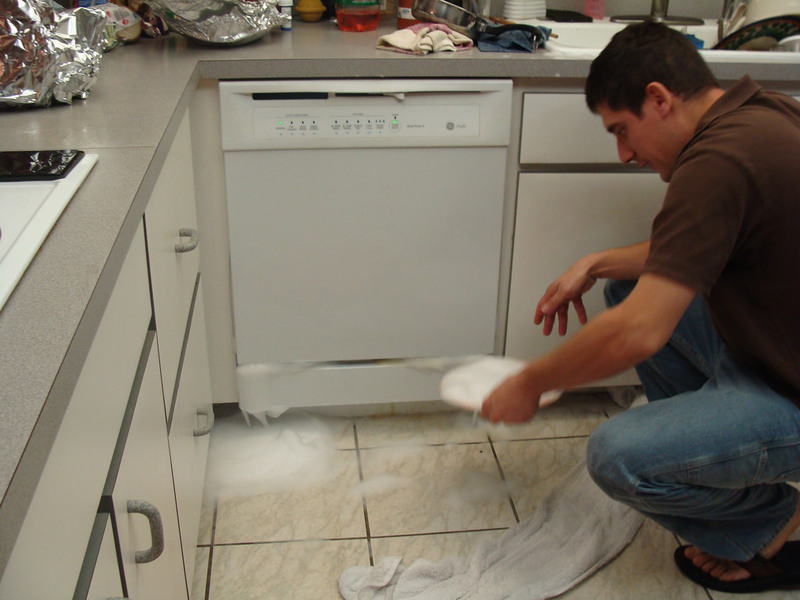 Appliance water damage can happen anywhere in the home, and can be difficult to catch and repair. The best defense against appliance water damage is a good offense: regular appliance maintenance and repair will lower the odds of something going wrong. Follow the warranty guide for how often to service your appliances, but pay special attention to these top ten notorious appliances that cause water damage. Anyone who’s ever failed to latch the dishwasher door all the way can attest that these machines can really spray. While modern dishwashers won’t start if the door is open, faulty sensors can tell you the door is sealed when it’s not. If the door isn’t sealed soap and hot water can leak or spray out, causing a major kitchen cleanup. These convenient appliances can lead to bad water damage because they tend to last a long time. Most people don’t want to replace their washer and dryer until they absolutely have to. Failed maintenance can lead to the washer leaking almost a full load, or leaking less dramatically for a longer period of time. Water damage promotes rot and mold. If your clothes are coming out of the washer smelling less than fresh, have your washer inspected for mold and leaks. While a toilet isn’t really considered an “appliance”, this infamous household feature is known to cause significant water damage. A clogged toilet causes unsafe water damage in the home. Contain this leak as soon as you can, but remember that contaminated sewage water is a health hazard! Always wear gloves when dealing with unsafe water. Water heaters are an “out of sight, out of mind” source of appliance water damage. Get the most from your heater by regularly getting it cleaned and checked so your showers stay hot and your basement stays dry. Air conditioner leaks can affect a large portion of your house. Make sure that you remove the drain pan frequently if your system requires it. Additionally, check around weather stripping and through vents if you do discover a leak. One of the largest appliance purchases you make, is your refrigerator. It also, a leading cause of water damage in the home. A loose seal around the freezer leads to spoiled food and flooring. If your fridge dispenses cold water or ice, make sure all the hoses are in place every time move your fridge. One of the most convenient appliances in the kitchen today is the garbage disposal. Because it is convenient, it is often abused and mistreated. This causes appliance water damage if you overload them. Shut off the disposal and use drain cleaner at the first sign of backup. Take care of your disposal, and don’t overload it. Filling your pasta pot from the stove is a convenience of every cooks dream. Stovetop pot filler often run off hoses connected to your main sink. One issue with this appliance happens when the hose slips if moved. The sealant also gets dry and brittle with age, which can result in chips and slow leaks. This is especially relevant to modern homes, as this is a newer feature for most kitchens. If you have a basement, then you most likely know the water damage that can occur with a broken sump pump. It usually leads to a flooded basement. This appliance water damage causes huge consequences in your basement. Be sure to have your pump checked regularly, but especially get it done before winter storms set in. If you run any pipes from your house, make sure they’re insulated. Frozen pipes wreak havoc inside and outside your home. Have a professional install your pipes to be sure they fit well, and keep them insulated even if you usually enjoy mild winters. Appliance water damage comes in all shapes and sizes. The best way to prevent water damage is to keep a maintenance schedule. Check the appliances yourself in between professional visits. The sooner you catch a leak the less damage it does.